Established in 1829, Athens’ National Archaeological Museum houses treasures unearthed from the many archaeological sites scattered throughout Greece, dating from prehistory to the late classical period. The expansive neoclassical building holds sculptures, bronzes, ceramics, and jewelry from Mycenae, Santorini, ancient Egypt, and beyond. Trace ancient Greek art through the ages as you walk the permanent collections, encompassing sculpture, metalwork, and antiquities. The National Archaeological Museum is easy to navigate and exhibits are clearly labeled, so many travelers explore independently. But a guided walking tour, especially a private tour, can yield dividends when it comes to navigating more than 11,000 artifacts. Tickets are available for the museum itself, or choose a combo ticket valid for multiple museums. The National Archaeological Museum is a must for history buffs and art lovers alike. The museum houses a cafe and a shop. The hop-on hop-off bus stops at the museum. The museum is wheelchair accessible, with a ramp at the entrance, elevator access, and accessible bathrooms. The National Archaeological Museum sits about two miles (three kilometers) north of Athens’ historic center in the Exarchia district. Given the challenges of driving in Athens, most visitors arrive by public transport. Ride the metro to Omonia (Line 2) or Victoria (Line 1), or choose between a wealth of bus and trolley options: bus 5 connects to the Acropolis. The hop-on hop-off bus also stops at the museum. The museum is open daily, with abbreviated hours on Tuesday, and extended hours from April 1 through Oct. 31. The museum is closed for major holidays. To beat the crowds, visit early in the day and avoid weekends and days when admission is free. As you’d expect in Athens, classical Athenian culture—which produced democracy, the Parthenon, and the plays of Sophocles—is well represented at the National Archaeological Museum. But other civilizations from ancient Greece feature strongly, including the Minoans, who occupied Crete and spawned the legend of the Minotaur; the Mycenaeans, who fought the famous battle for Troy; and the Ptolemies, the Hellenistic ancient Egyptian dynasty to which Cleopatra belonged. Recognized as one of the greatest of the world’s museums its exhibits contain the largest collection from Greek antiquity with unmissable and seminal pieces from the Gold 'Death mask of Agamemnon', leader of the Greeks in the Trojan war, to the 2000 year old 'Antikithera mechanism' and worlds first computer; the Cup of Nestor referred to in Homers iliad, to the 'Ring of Theseus' to Masterpieces of sculpture such as the statues of Aphrodite & Poseidon each with stories to tell.In the company of your Licenced Professional guide dedicated to your group alone, 'Skip the line' and delve into 5000 years of one of the worlds great civilisations as many of its cornerstones and highlights are brought to life before your eyes.For travellers not wanting to miss the essentials of Greece to the most dedicated of History enthusiasts & suitable for all ages, this is a hugely informative & fascinating tour to include in any itinerary in Greece & will greatly enrich the experience of your visit. Explore the National Archaeological Museum, one of the world’s greatest museums, along with other historical highlights of Athens on this 3-hour private walking tour. Witness the best of the 200,000 and more Greek treasures at the famous Athens archaeological museum, viewing everything from sculptures and artworks to pottery from prehistoric times to late antiquity as your guide details their history. Plus, stroll past some of Athens’ neoclassical buildings, see the Tomb of the Unknown Soldier at the Greek Parliament House, and view some fascinating archaeological finds displayed at Syntagma Square. See Athens’ main attractions with your own private group on a full-day city tour by minibus for up to 19 passengers. With a knowledgeable driver-guide, you’ll visit the Acropolis of Athens and the Acropolis Museum to soak up the archaeological wonders of this ancient city, plus see an array of other landmarks like the Tomb of the Unknown Soldier and the Panathenaic Stadium. Pickup is available at hotels or the cruise port. Delve into Athens’ rich history and art heritage and tick off two of the city’s most fascinating museums on this 4-hour tour. First, follow your art-expert guide around the Byzantine and Christian Museum and marvel at religious art from as early as 600 BC. Admire the stunning collections of Coptic Christian paintings, mosaic icons and medieval books, then stop for refreshments at the museum café (own expense). Next, browse the prized exhibits on display at the National Archaeological Museum, including Ancient Greek art and relics from the Stone Ages. Independent travelers seeking an in-depth experience will love a self-guided mobile tour of the Athens National Archaeological Museum. Conveniently available for both iOs and Android, this app allows you to explore the museum at your own pace. The audio guide offers an offbeat look at Greek life that you won’t get from a brochure. Monitor your location on the interactive map and stop only in the galleries that interest you. 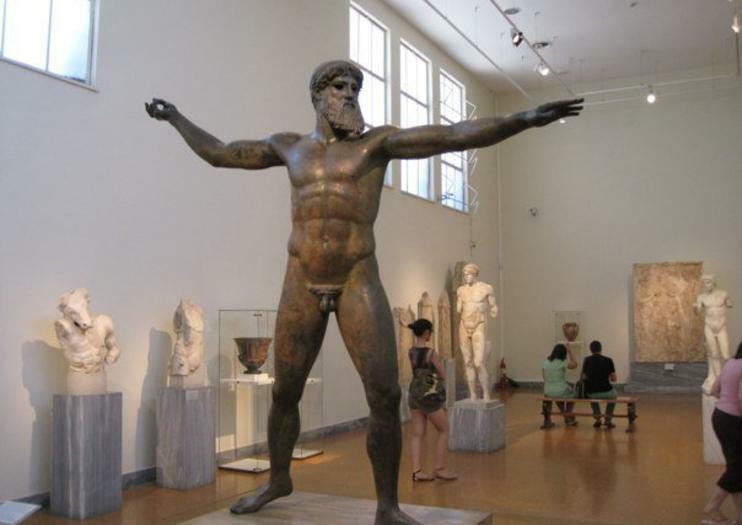 Combine one of the Greatest Museums with the tour of Athens. Visit the Panathinaic Stadium where the first Modern Olympic games took place. The Zappeion and the Syntagma Square, the complex of the Academy of Athens, tha National Library and the University. Finally we will visit the National Archaeological Museum one of the must see spots in Athens. It houses some of the most important artifacts from a variety of archaeological locations around Greece from prehistory to late antiquity. You will see the musk of Agamemnon, the infamous statue epicted either Zeus holding the thunderbolt or Poseidon carrying his trident.The Thera Room draws the attention of visitors mainly through the celebrated wall paintings, the “Spring Fresco” with the sparrows and the lilies, the “Boxing Children Fresco” and the “Antelope Fresco”.The museum is considered one of the greatest museums in the world and contains the richest collection of artifacts from Greek antiquity worldwide. Greece is famous for the marvelous ancient sights, the sea and the gastronomy! Have a combination of one of the world’s best museums, sightseeing of the Center of Athens and a perfect food slow pace tour! Walk and learn about the history of the city while tasting several local specialties! The tasting is pretty big! You will have pies, a food tasting in a small deli with halva, honey, cheese and many more! The tour has eating in two taverns Make sure you are hungry! Before the museum you will taste traditional meze and the second for lunch with Cretan delicacies. A food tour must have a dessert and the best dessert is loukoumades!Visit the most important museum in Athens and one of the greatest in the world. The National Archaeological Museum houses some of the most important artifacts from a variety of archaeological locations around Greece from prehistory to late antiquity. The National Archaeological Museum is one of the must see spots in Athens. It houses some of the most important artifacts from a variety of archaeological locations around Greece from prehistory to late antiquity. You will see the musk of Agamemnon, the infamous statue epicted either Zeus holding the thunderbolt or Poseidon carrying his trident.The Thera Room draws the attention of visitors mainly through the celebrated wall paintings, the “Spring Fresco” with the sparrows and the lilies, the “Boxing Children Fresco” and the “Antelope Fresco”.The museum is considered one of the greatest museums in the world and contains the richest collection of artifacts from Greek antiquity worldwide.Hotel Pick up and drop off can be arranged with an extra cost. Enjoy a private guided tour , with a luxury mini van, of The National Archaeological Museum, which is the largest museum in Greece and one of the world's great museums. Its abundant collections, with more than 20,000 exhibits, provide a panorama of Greek civilization from the beginnings of Prehistory to Late Antiquity .Continue with a drive through the City center, visit the marble stadium where were held the first Olympic games of the modern era and finish your half day tour by discovering the secrets of the Acropolis, which make it stand as the most important monument of the whole world. Do you believe in ancient curses? Indiana did. And so do we! In this unique tour you become the heroes to unfold the mystery hidden for thousands of years under the dust of time. As the transition from the old Athens of the Classical Era to the new Athens of the Roman period is being explored, a dark secret lays hidden and it is up to you to uncover it… Be careful, though! Some of the old Gods may not be on your side…This is a 4-day tour for those looking for something unique and different in Greece. The experience is designed in a way that you will discover many of the most important sights in Athens and Delphi in an interactive and experiential way. You are the heroes in the story! Each day consists of a morning tour (usually 4 hours) and an afternoon tour (usually 3 hours). We do not offer meals or accommodation since we are not bound to low quality touristic places. If you wish, we can offer you good suggestions of authentic places we have tried ourselves.